At first there is a black web over the face of the stone. A ray of light pierces it from behind and above. Then cometh a black cross**2**, reaching across the whole stone; then a golden cross, not so large. And there is a writing in an arch that spans the cross, in an alphabet in which the letters are all formed of little daggers**3**, cross-hilted, differently arranged. And the writing is: Worship in the body the things of the body; worship in the mind the things of the mind; worship in the spirit the things of the spirit**4**. “Impure” means those whose every thought is followed by another thought, or who confuse the higher with the lower, the substance with the shadow. Every Aethyr is truth, though it be but a shadow, for the shadow of a man is not the shadow of an ape**6**. (The shew-stone is pressed upon my forehead and causes intense pain; as I go on from Aethyr to Aethyr, it seems more difficult to open the Aethyr. The golden cross has become a little narrow door, and an old man like the Hermit**7** of the Taro has opened it and come out. I ask him for admission: and he shakes his head kindly, and says: It is not given to flesh and blood to unveil the mysteries of the Aethyr, for therein are the chariots of fire**8**. and the tumult of the horsemen; whoso entereth here may never look on life again with equal eyes. I insist. The little gate is guarded by a great green dragon. And now the whole wall is suddenly fallen away; there is a blaze of the chariots and the horsemen; a furious battle is raging. One hears nothing but the clash of steel and the neighing of the chargers and the shrieks of the wounded. A thousand fall at every encounter and are trampled under foot. Yet the Aethyr is always full; there are infinite reserves. No; that is all wrong, for this is not a battle between two forces, but a mle in which each warrior fights for himself against all the others. I cannot see one who has even one ally. And the least fortunate, who fall soonest, are those in the chariots. For as soon as they are engaged in fighting, their own charioteers stab them in the back**9**. And in the midst of the battlefield there is a great tree, like a chinar-tree**10**. Yet it bears fruits. And now all the warriors are dead, and they are the ripe fruits that are fallen – the ground is covered with them. And now there is a mighty god, Sebek**12**, with the head of a crocodile. His head is gray, like river mud, and his jaws fill the whole Aire. And he crunches up the whole tree and the ground and everything. Now then at last cometh forth the Angel of the Aethyr, who is like the Angel of the fourteenth key of Rota**13**, with beautiful blue wings, blue robes, the sun in her girdle like a brooch, and the two crescents of the moon shapen into sandals for her feet. Her hair is of flowing gold, each sparkle as a star. In her hands are the torch of Penelope and the cup of Circe**14**. She comes and kisses me on the mouth**15**, and says: Blessed art thou who hast beheld Sebek my Lord in his glory. Many are the champions of life, but all are unhorsed by the lance of death. Many are the children of the light, but their eyes shall all be put out by the Mother Darkness. Many are the servants of love, but love (that is not quenched by aught but love) shall be put out, as the child taketh the wick of a taper between his thumb and finger, by the god that sitteth alone**16**. And on her mouth, like a chrysanthemum of radiant light, is a kiss, and on it is the monogram I.H.S. The letters I.H.S. mean In Homini Salus and Instar Hominis Summus, and Imago Hominis deuS. And there are many, many other meanings, but they all imply this one thing; that nothing is of any importance but man; there is no hope or help but in man**17**. And she says: Sweet are my kisses, O wayfarer that wanderest from star to star. Sweet are my kisses, O householder that weariest within four walls. Thou art pent within thy brain, and my shaft pierceth it, and thou art free. Thine imagination eateth up the universe as the dragon that eateth up the moon. And in my shaft is it concentrated and bound up. See how all around thee gather my warriors, strong knights in goodly armour ready for war. Look upon my crown; it is above the stars. Behold the glow and the blush thereof! Upon thy cheek is the breeze that stirs those plumes of truth. For though I am the Angel of the fourteenth key, I am also the Angel of the eighth key**18**. And from the love of these two have I come, who am the warden of Pop and the servant of them that dwell therein. Though all crowns fall, mine shall not fall; for my plumes reach up unto the Knees of Him that sitteth upon the holy throne, and liveth and reigneth for ever and ever as the balance of righteousness and truth. I am the Angel of the moon. I am the veiled one that sitteth between the pillars veiled with a shining veil, and on my lap is the open Book of the mysteries of the ineffable light**19**. I am the aspiration unto the higher; I am the love of the unknown. I am the blind ache within the heart of man. I am the minister of the sacrament of pain. I swing the censer of worship, and I sprinkle the waters of purification. I am the daughter of the house of the invisible. I am the Priestess of the Silver Star**20**. And she catches me up to her as a mother catches her babe, and holds me up in her left arm, and sets my lips to her breast**21**. And upon her breast is written: Rosa Mundi est Lilium Coeli**22** squares in the midst. It radiates a blaze of light, too dazzling to make out the characters, and a voice says: Non haec piscis omnium**23**. (One important meaning of 'Ιχθ 'σ: it is formed of the initials of five Egyptian deities and also of five Greek deities: in both cases a magic formula of tremendous power is concealed**25**. As to the Holy Table itself, I cannot see it for the blaze of light; but I am given to understand that it appears in another Aethyr, of which it forms practically the whole content. And I am bidden to study the Holy Table very intently so as to be able to concentrate on it when it appears. I have grown greater, so that I am as great as the Angel. And we are standing, as if crucified, face to face, our hands and lips and breasts and knees and feet together, and her eyes pierce into my eyes like whirling shafts of steel, so that I fall backwards headlong through the Aethyr**26** —and there is a sudden and tremendous shout, absolutely stunning, cold and brutal: Osiris was a black god**27**! And the Aethyr claps its hands, greater than the peal of a thousand mighty thunders. November 30, 1909 10-11:45 p.m.
Bookmark this page on these social networksPOP = ♌♎♌ = טלט. This Aire introduces the Hegemone, or leader of the Candidate through the Ceremony of Initiation. She is the Holy Guardian Angel, in the form of Isis-Urania, the Instructress. p is ☉ in his Northern declination, the form of Horus in his strength of Summer. 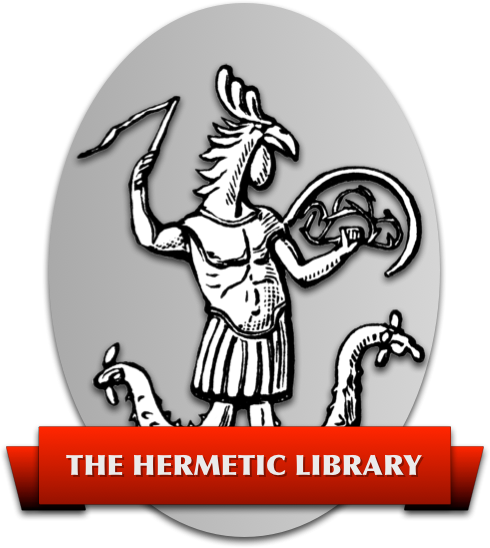 He appears in his dual form, as it were the pillars between which the Hegemone, who bears a mitreheaded wand, symbolical of the Balances, is seated. (See the Neophyte Ceremony —Equinox, I, II, pp. 244-261.) She is the reconciler between all opposites. (See the Ceremony of the Equinox — given in Equ. I, VII, pp. 372-5). Her function is to equilibrate all symbols in the sphere of the Candidate; this is the one supremely important formula of Instruction. This Aethyr contains accordingly the knowledge (somewhat fragmentary at first sight) necessary to the Aspirant to the Grade of Magister Templi. 48 is ליח, a woman; also strength, an army. ח the Bearer of the Graal; and the seed of life; ל the Balances, i.e. She bears the Seed of Life in the Holy Cup ion balance. 48 is םה Ham; see the sudden Revelation at the end of the Vision. Bookmark this page on these social networksThe Hebemone wears a Black Cross. See also 16th Aire, last paragraph. Bookmark this page on these social networksThe idea is that every idea, however apparently atomic, is to be analyzed. Bookmark this page on these social networksWorship all things; for all things are alike necessary to the Being of the All. But keep separate the planes. Failure to do this is the most frequent Cause of error. Bookmark this page on these social networksFor purity means full simplification — and the keeping of each idea in its Own true perfection, separate from all others. Bookmark this page on these social networksWorship each thing in itself for its own sake, not inventing ideas. Bookmark this page on these social networksSee Note 1. This is the Sphere of Kokab (☿). Hence the Man of Atu IX. Bookmark this page on these social networksThe Chariot (Atu VII) of the Bearer of the Sangraal. (See Note 1). ח depends from Binah, the sphere of the Hegemone. Bookmark this page on these social networksThis seems to be a Vision of the Ideas which the Alphabet of Daggers is to analyze. The confusion suggests the influence of Choronzon. It is a warning of what the Aspirant must expect if he once lose his grip on Binah. Bookmark this page on these social networksOne of the noblest trees of Hindustan. Bookmark this page on these social networksThe Tree of Life bears fruit of innumerable ideas. They are all self- destroying and valueless unless organized by Understanding. Bookmark this page on these social networksThe Saturnian Destroyer — as opposed to Shiva. Time swallows up all ideas, all experiences, Life itself. That is a statement of the condition which the Exempt Adept aspires to transcend by becoming a Magister Templi. Bookmark this page on these social networksShe is the Angel of Binah, though in this form. For Atu XIV is Sagittarius, the house of the Huntress. Bookmark this page on these social networksShe keeps Love alight by patient Fidelity — the Holy Guardian Angel awaits eternally the address of Her Charge. And she is also the Arch- harlot, always ready to seduce and to intoxicate him who lusts after Her. Bookmark this page on these social networksRelations with the Seer have been established long ago. Bookmark this page on these social networksThe Destruction of the Universe by the Devourer of all Things is the necessary beginning of the Initiation to the Grade of Magister Templi. Bookmark this page on these social networksMan is the Candidate; he partakes of the Truth of all the Gods initiating. Bookmark this page on these social networksSee note 1. Bookmark this page on these social networksSee note 1. She is Isis-Urania, in Atu II. As Atu XIV she leads directly upwards to Tiphereth (ו), as Atu VII directly upwards to Binah (ה), and as Atu II, directly upwards to Kether (the top point of י). Bookmark this page on these social networksThe full title of Atu II. Note “Silver Star” as title of the Third Order. Hence she must appear as Hegemone to lead the Candidate to the first grade of that Order — Magister Templi. Bookmark this page on these social networksi.e.. Malkut is Binah. (The two Hehs of Tetragrammaton are attributed to these Sephiroth; the daughter does indeed become the mother. Bookmark this page on these social networksPisces = fish. Nun literally means fish. Qoph refers to the sign Pisces. The versicle means: She is not attained by all men. Bookmark this page on these social networks'Ιχθ'σ = 1219 = תישארב רזוי. The Former (rock-maker) of that which was in the Beginning. It refers to נ and ק: to נ because the Fish is “Life in the Water”, i.e. the Primal Water of Thales: to ק because Atu XVIII shews that Life appearing in the Waters of Midnight, Kephra in the Pool of Great Dark Sea. This is the Glyph of Birth natural to Binah. There is presumably a further mystery — numerical — still not found. Isis — The Mother – Binah I.
Cneph — The Winged Egg — Binah Ch. Thoth — The Moon God (measurer Themis — the satisfied woman of time) אמיא Uramoth — The Water Goddess Uranus — Heaven, sphere above (The Great Sea) the Abyss. Sebek — The Devourer (Time) Selene — The Moon All these deities represent divers forms and functions of the Idea of Binah. How to combine them in order to obtain Magical Formulae must be studied in the light of Book 4, Part III. Bookmark this page on these social networksThe Seer cannot make Union with his Guide. She is the feminine form of his Holy Guardian Angel; but the impulse to unite is only valid when it comes from above. In the 20th Aire this was the case; and so the Marriage was accomplished. Bookmark this page on these social networksThis, to the Seer at that time, was a Revelation of the most appalling terror. The doctrine of the Third Order had not been promulgated. He expected to unite with the Great Mother in a Mode similar to that experienced in attaining to the Knowledge and Conversation of the Holy Guardian Angel. But the attainment of the Grade of Magister Templi involves the Annihilation of the aspirant. “Osiris was a black god”; i.e. of the nature of Binah— BLACK. The love of Binah is that of the Queen Scorpion, who devours her mate. This revelation therefore, was much as if a romantic lover of the Richard Feveral type, were suddenly made fully aware that the Maiden of his Dreams intended to conclude their First Night of Love by a Breakfast, of which he was to form the staple dish! The Doctrine implied is that one must not be the child, but the Mother.